A horde of howling, ripping green-skinned fiends was: bearing down upon beleagured Dwarfhold. The catapult crew worked their machine frantically, raining rocks, down the advancing hordes, but the advance seemed irresistible. Then true disaster struck. For a hundred yards around the catapuIt, there was not a rock to be seen - all had been prised out of the ground and fired at the approaching, Goblins. Despite the enthusiastic offers of young Gorm Foambeard to be fired instead of a rock, the situation looked hopeless. Then Gottri Flatnose had an idea. Before anyone could stop him. Gottri had picked up one of the large mallets used to fire the catapult. and was running towards the advancing Goblins. A group of three or four Goblins had left their felIows behind, and Gottri felled two in as many blows of the mallet. By the time the others caught up, only one Goblin remained to be quelled with a swift kick to the lower body. "Quick!" roared Gottri, "Truss &apos;em, up before they come round! Here&apos;s our ammunition. The insensible Goblins were soon securely tied and carried back to the machine. "Don&apos;t look so upset greeny" chuckled Gottri as the first Goblin was loaded, "You&apos;re going back to your mates." The arm snapped upright, and the netted Goblin hurtled through the air. "AZZAAAAAAADDZ..." it howled as it flew. The Dwarfs looked at each other with an air of injured innocence, then loaded the second. The effect of these missiles was remarkable. The Goblin front rank faltered. Gottri, emboldened by his first success, stood some way in front of the machine with his mallet in one hand, grinning and beckoning. 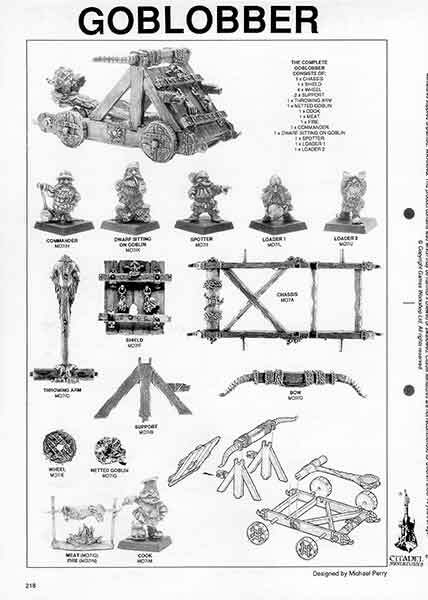 The Goblin charge broke - clearly no-one wanted to be next in the catapult - and despite the curses and shouting of their officers, they stopped dead. The next shot flew with unerring accuracy into the middle of the Goblin command group, scattering the assembled chieftains and turning the whole army to flight. Cheering Dwarfs crowded round the catapult crew as the last of the Goblins dwindled on the horizon. 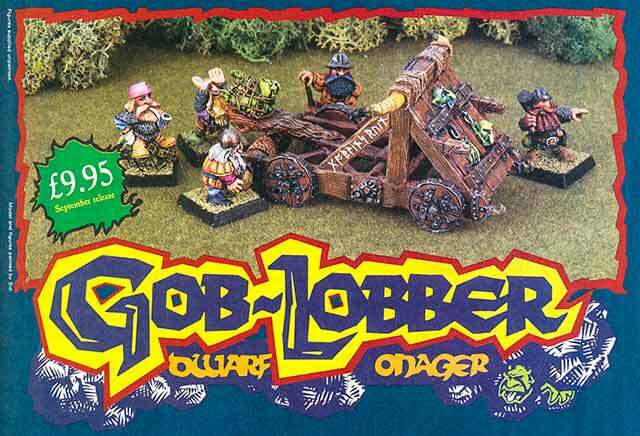 A great feast was held to the invention of the Gob-Lobber, as it came to be known, and had the Goblin hordes returned during the next few days, they would have had difficulty a single Dwarf capable of fighting.